I am a woman who has a deep inner knowing that I am here to make a difference and in some small way alleviate unnecessary suffering in women’s lives. I love to work with awakening women who have a sense that they are meant to go on an inner journey of healing, growth, and transformation. I am a certified meditation and mindfulness teacher, and ex-nurse who worked for over 30 years in a vocation that fed my soul. My specialty is helping women integrate meditation, mindfulness, and other spiritual practices into their lives in a way that makes a difference to their health, relationships, and contributions. Since 2013, I have been teaching, coaching, and guiding women who are seeking ways to feel more peaceful and are being called to awaken to the deeper truths of their souls. Many of the women I work with feel that they are in a fog in some aspect of their life and lack the tools to look inside themselves for answers. I have taught hundreds of women how to meditate and guided many women that want the life-changing tools without the religious or spiritual affiliations that often accompany these practices. I’ve facilitated training sessions and workshops in corporations, conferences, retreats, and in a university setting. I write extensively about meditation, mindfulness, and spirituality and have been featured in numerous publications. I’ve co-authored two books and released Awakening a Woman’s Soul: The Power of Meditation and Mindfulness to Transform Your Life in January 2019. For many years I worked as a nurse. When I left nursing to explore life beyond a career that had been deeply fulfilling, I felt somewhat lost. A few years later, as I was standing on top of Mount Kilimanjaro, one of the highest peaks in the world, I had never been lower. My life had lost a sense of meaning. I had lost touch with who I was at my core. This inner feeling of what I now call “soul hunger” was causing stress-related health issues. I wasn’t sleeping well, had a racing mind, headaches, thyroid issues, and had gained some weight that seemed to stick to me like glue. My doctor told me that my stress hormone, cortisol, was not within the healthy range. She asked me if I was meditating. 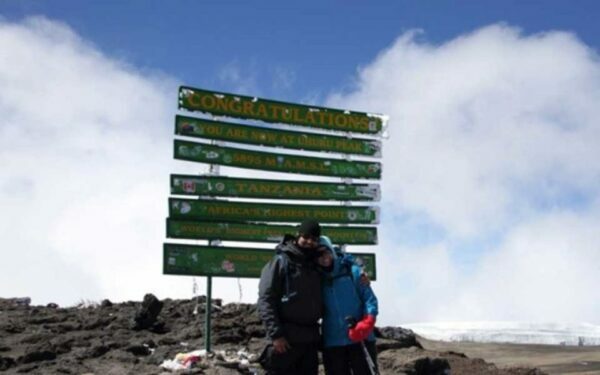 On top of the world with my husband Mark, January 2012. I had no idea what that really entailed. The only image I had was someone sitting cross-legged on the floor with their eyes closed. Nope, meditation may be good for others, but not me. In a quest to get my stress hormones under control, I attended a talk at a local natural food store about healthy eating and stress. A key message I came away with was this: To detoxify your body you need to detoxify your mind and the best way to do that is through meditation. Everywhere I turned I was hearing about meditation, so I decided that maybe it was something I was meant to explore. I started to meditate by committing to five minutes a day. An amazing thing started to happen as a result of my practice- I began to feel differently. I felt calmer, more focused, creative, loving, peaceful and less stressed. I started to sleep better and most importantly, started living my life enjoying more moments- with fewer regrets about the past and less worry about the future. All of a sudden I wasn’t “forcing” myself to meditate. I was grateful for the opportunity to live with a more peaceful mind. I knew that meditation was making a difference but I was still somewhat surprised when I went back to my doctor and she reported that my stress hormones had returned to “normal.” The only thing I was doing differently was meditating on a daily basis! Now convinced about the benefits of meditation, I wanted to understand the ancient wisdom and current research behind it. I wanted to know more about this ancient practice and understand the science behind it. That’s when I decided to embark on the teachers’ path through The McLean Meditation Institute. The philosophy and approach to meditation felt comfortable for me and I began a year of studies, self-discovery, and exploration of different techniques. For the past number of years, I have meditated on a daily basis and this has literally changed my life. I have taught countless people how to introduce a practice into their own lives and supported others being called to transform to a way of being that honors their deeper truths. As I began sharing what had worked for me, I heard from many women that they were hungry for these practices and a way of being that enabled their body, mind, and soul to thrive. This inspired me to develop and share a unique and proven “Ignite Your Inner Spark” program that serves as a blueprint and a step-by-step process to help women transform their thoughts, emotions, beliefs, and actions that weren’t serving them. I didn’t invent these meditation, mindfulness and other transformative tools and practices, however, I did put them together in a way that created space for deep healing, growth, and transformation. My approach is geared toward getting to the root cause of misalignment in our lives rather than merely addressing the symptoms. While quick fixes that are geared to spiritual entertainment rather than transformation may be appealing, they often do not result in the lasting and significant changes that we are seeking. The women I work with receive all their own personalized tools that enable them to calm their mind, deal with emotions and look inside themselves for their own answers. I worked as a nursing leader for 30 years in the field of dementia and end of life care. I received my Bachelor’s in Nursing degree from the University of Alberta and a Master’s Degree in Nursing from the University of Calgary. After retiring from nursing, I became certified as a meditation and mindfulness teacher through the McLean Meditation Institute. For the past several years, I have been fully immersed in spiritual studies, which lead me to take graduate level classes in psychology and spirituality. I have completed programs in life coaching, deep transformational coaching, mindfulness training, the nature of prayer, and many other courses. While I value formal learning and education, I have come to realize that our most valuable asset is our own journey and the wisdom we gain through living a fully conscious life. I live in Calgary, Alberta with my husband, Mark and dog, Molly. I love to connect and welcome questions by email. I also love to connect via Facebook.